Toyomansi is my latest favourite sauce. It's a Filipino soy sauce with calamansi lime juice, a sourish soy with a citrus fragrance. I like it but having had fresh calamansi before, I have a suspicion some flavouring other than real calamansi is added but on the label flavouring is not listed. Toyomansi is available from most oriental supermarkets, quite cheap under £2 for a large bottle of 750ml. Calamansi lime (or limau kasturi in Malay) is an S E Asian small sour citrus fruit, bigger than kamquat and much smaller than green lime, used in the same way like green lime. The flavour of fresh calamansi I would say a cross between kamquat and green lime. Recently I have found frozen whole calamansi at my local Chinese supermarket was tempted to get some but not sure if they are any good frozen. I used toyomansi as a dipping sauce on its own or mixed with chopped chilli and some sugar for a spicy sweet and sour sauce, quite tasty with fried food. I have also used toyomansi as a marinade for grilled meat like chicken drumsticks and pork chops. Another use I like is to add chopped ginger to toyomansi and use it as a dipping sauce for Chinese dumpling jiaozi. Everything I have tried so far I loved it. Bistek is a Filipino word I guess derived from 'beef steak'. Bistek is normally related to a recipe of fried beef with onion. The beef is flavoured with soy sauce and calamansi lime juice. If you cannot find calamansi you can use normal green lime. Having bought this toyomansi I used it for this recipe which works quite well. 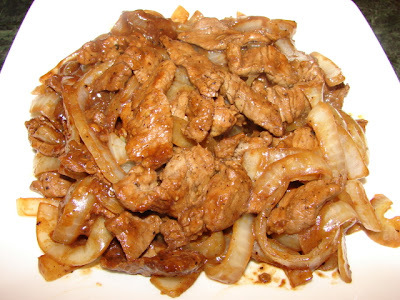 This tart flavoured beef and onion is quite tasty with rice. Very simple to make. Marinate beef with sauces and black pepper for about 30 minutes to 1 hour. Before cooking, drain off all the beef marinade into another bowl for later use. If frying the beef with the marinade you will end up stewing the meat than searing it. Heat a clean wok/pan with some oil till smoking. Add beef and garlic, spread the meat around the pan/wok. Do not stir leave it to sear till bottom is browned. Cook to medium rare or well done to your choice. The heat must be on fullest to ensure the meat is searing then stewing. If a lot of juice is coming out of the meat while searing, stir in some slackened cornflour this will help the meat the sear than bleeding with juice. Add the cooked onion and some or all of the marinade. Stir briefly, have a taste to check if you need some sugar to balance the flavour and more ground pepper. If the sauce is watery can add some slackened cornflour to thicken. I've not heard of toyomansi before but you've convinced me that I need to find a bottle of it! Sounds like ponzu; i must find me some. Hi! Bistec is actually "steak" "in Spanish. And you're quite correct. Toyomansi's the perfect dipping sauce for jiaozi, as well as shumai.